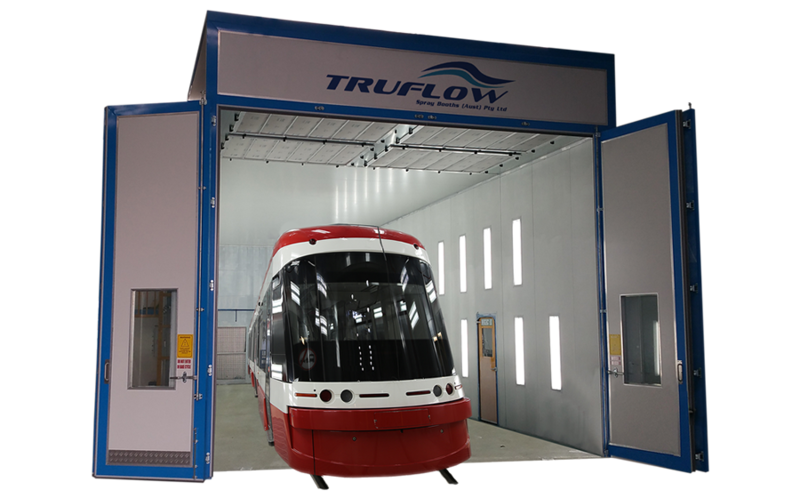 For any Train, Tram, Locomotive or Rail related project for re-refinishing and surface coatings the TRUFLOW Spray Booths Team aim to be the first point to call. Our experienced team help with early stratigic design to ensure the project starts with the right information and scope. Delivering solutions on time and on budget is the dedicated approach that our team takes to its clients. So its no wonder that over the last 20 years we have successfully delivered projects to Siemens Trams, Bombardier Transportation, Yarra Trams and the Downer Group. 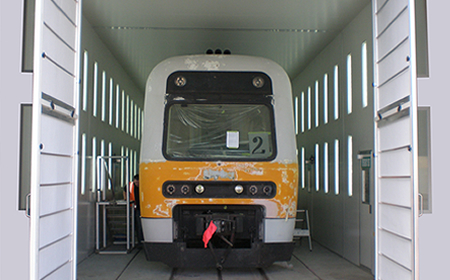 When working on a rail project the spray booth design will always have some key restrictions. These might be limited space, difficult or large products, awkward access or specific production volumes. 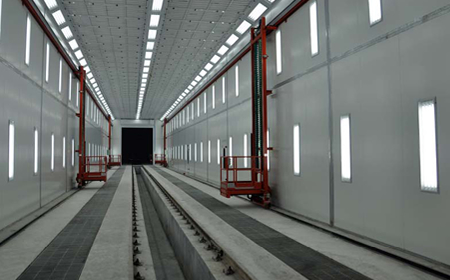 Our spray booths facilitate the surface treatment process required by manufacturers and refurbishment teams of rolling stock wagons, locomotives and bogies. The finishes may be corrosion protection, long-haul maintenance or new OEM products. Which ever of these apply to the process or facility; TRUFLOW has always been able to work within the limits of the project and deliver a solution that fits the clients needs. The benchmark facility in rail is the downdraught system. Complete with 3-Axis Lifts for painters to access both side of the locomotive this facility provides a fully enclosed environment with filtered air exhausted under the rail or through the side walls. Downdraught Spray Booths can also been seen under Truck Spray Booths and Bus Spray Booths pages. Cross flow Booths are ideal for spray painting in a clean and enclosed environment. They operate with horizontal airflow and can be fitted with or without heating. 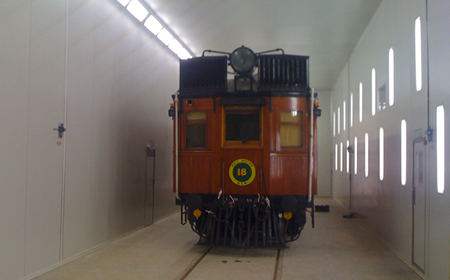 The above example is an installation completed by TRUFLOW at the NSW Rail Museum in Thirlmere, click the link to read more about this installation. WALL-MAN & LIFT-MAN platforms are pneumatically operated access systems. They are ideal for hazardous and flammable environments. They are commonly utilised for large equipment, Truck, Train and Bus Spray Painting. 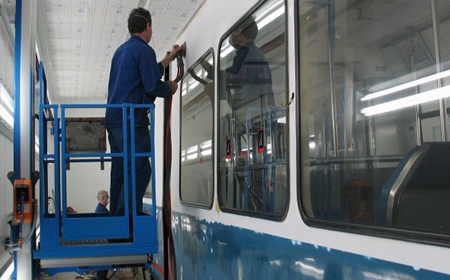 Since 2008 Truflow has been providing Bombardier Transport with spray painting facilities that provide safe, clean and efficient surface coating environments for their workers. With special considerations to airflow and lighting these facilities are large enough to facilitate new projects or refurbished works on existing locomotives. For similar Spray Booths check out : Bus Spray Booths, Truck Spray Booths and Semi- Trailer Spray Booths. 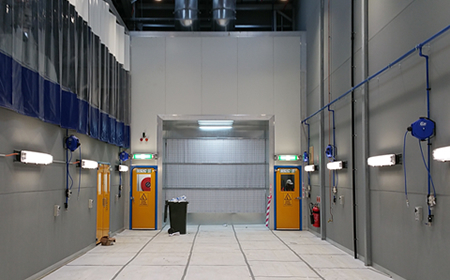 The Ballarat facility operated by UGL Rail / Alstrom is a fit for purpose manufacturing and assembly facility designed to accommodate locomotive bogies in the spray booth that was designed and installed by TRUFLOW. Siemens undertook a large scale re-refurbishment of the Melbourne City D-Class trams which required a state of the art painting facility to be installed at the Preston depot. 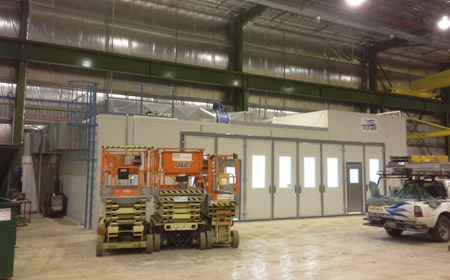 This on-floor down draft spray booth was in full scale production for 3 years, it was a project specific spray booth which provided both spraying and baking capabilities. 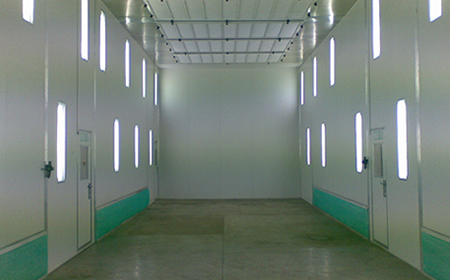 For similar Spray Booths check out : Truck Spray Booths and Large Equipment Spray Booths. A unique project which required a versatile solution. The new Preston facility required a space which allowed for Trams & Parts to be painted, cleaned and stripped in the one area. With both preparation and painting occurring in the same area a semi downdraught type spray area was designed which could be integrated into their facility.